The New York Times is talking about brands producing their own shows. The shows they write about are large budget productions mostly aired on cable TV. On a much small scale, I noticed some brilliant marketing happening on YouTube yesterday. Blendtec blenders has been producing little shows titled “Will It Blend?” (they also have a web site). 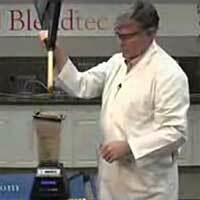 Each show is simple, a guy in a lab coat shoves some odd items into one of their Blendtec blenders and you get to see what happens. Blended items include credit cards, golf balls, marbles, and a rake handle. It’s a brilliant idea. Each show is quick, exciting, and quirky. The dorky lab-coated guy and the 20 year old theme really solidifies it’s kitschiness. People actually seek out and enjoy this advertising (at the moment, the golf ball episode is featured on the YouTube front page with almost 1 million views and a 4 1/2 out of 5 star rating).